Wedge blocks are now banned on kickoffs. Messages on eye-black, such as those worn by Tim Tebow, Reggie Bush, and Case Keenum are no longer allowed. Multiple conferences announced changes in membership throughout 2010, triggering a major realignment that would eventually affect all 11 FBS leagues. Due to conference notice requirements, these changes would not take effect until 2011 at the earliest. The first change came on June 10, when the Pacific-10 Conference announced that Colorado had accepted their invitation to join from the Big 12. The following day, June 11, saw two schools change conferences. The Mountain West Conference announced that Boise State had accepted their invitation to join from the Western Athletic Conference (WAC), while Nebraska ended its longstanding affiliation with the Big Eight/Big 12 to join the Big Ten Conference. Both moves would take effect starting with the 2011-2012 academic year. In the following days, it was widely speculated that the five public schools in the Big 12 South Division (Texas, Texas A&M, Texas Tech, Oklahoma, and Oklahoma State) would leave for the Pac-10 to create a 16-team "superconference." However, a last-minute deal announced on June 14 saw Texas remain in the Big 12, prompting the other four schools to follow suit. The Pac-10 then extended an invitation to Utah on June 16, who accepted the next day. With the addition of Colorado and Utah, the Pac-10 announced that the conference would change its name to the Pac-12 upon the two new members joining in July 2011. On August 18, the Mountain West responded to rumors of the imminent departure of Brigham Young by inviting WAC members Fresno State, Nevada, and Utah State. Utah State declined the offer, but Fresno State and Nevada accepted later that day. Following threats of legal action by the WAC, the two schools agreed to stay in the WAC through the 2011-12 season in exchange for a greatly reduced exit fee. BYU officially announced their departure from the Mountain West on September 1. The BYU football team would become an FBS Independent while all other sports would move West Coast Conference for the 2011-12 season. On November 11, the Western Athletic Conference announced that Texas State, then a member of the FCS Southland Conference, and UTSA, which planned to launch a football team in 2011, would upgrade their football programs to FBS level, join the WAC in 2012, and become full FBS members in 2013. On November 29, TCU announced it would leave the Mountain West to join the Big East in 2012. The Mountain West replaced TCU by adding Hawaiʻi as a football-only member on December 10; Hawaiʻi's other sports would join the Big West Conference. Alabama: The seventh major expansion of Bryant–Denny Stadium increased the capacity from 92,138 to 101,821. East Carolina: The east end zone at Dowdy–Ficklen Stadium was enclosed, increasing capacity from 43,000 to 50,000. Louisville: A second deck was added to the east side of Papa John's Cardinal Stadium, increasing capacity from its original 42,000 to over 56,000. Michigan: Michigan Stadium once again claimed the title of largest college football stadium. The new capacity was officially announced on July 14 as 109,901. Texas Tech: Renovations to Jones AT&T Stadium increased the capacity to 60,454 and a new building on the stadium's eastern side added an additional 26 suites and 500 club seats. USC was not eligible to be ranked in the USA Today Coaches Poll due to NCAA sanctions. They were also prohibited from playing in a bowl. On September 11, Virginia Tech, then #13 in the AP Poll, was stunned at home by in-state FCS team James Madison. The Dukes' 21–16 victory was only the second by an FCS school over a ranked FBS team, after Appalachian State's historic upset of Michigan in 2007. The University of Texas reached an agreement with ESPN to distribute the Longhorn Network on cable systems in the fall of 2011. The deal is for 10 years and guarantees Texas $12 million annually on top of the television revenue UT would receive as part of the Big 12's current television contracts with ABC/ESPN and Fox. The Longhorn Network would be the first sports-centric network for a university and was slated to broadcast third-tier programming, but UT men's athletic director DeLoss Dodds has asked the Big 12 to be allowed to air one football game, and a smattering of men's basketball games. The CBS telecast of the Iron Bowl between Alabama and Auburn on November 26, 2010 earned a 7.5 rating, the highest for any game of the 2010 college football season through week 13. In 2011, Ohio State vacated all twelve wins and their share of the Big Ten title from the 2010 season after it was revealed that several players had committed NCAA violations by receiving improper benefits from a local business owner. Despite not being in the BCS rankings, Connecticut (8–4) played in the Fiesta Bowl by virtue of being the Big East Conference Champion. Penn State football coach, Joe Paterno, in his 45th season, has achieved a feat that no coach in major college football history has ever reached: the 400-win mark. Paterno already held records for the most wins in major college football history as well as the most bowl wins (24) in college football history. Kyle Brotzman of Boise State set a new Division I record for most career points by a kicker. His 439 career points surpassed the former record of 433 by Art Carmody of Louisville. Miami (Ohio) became the first team in FBS history to win 10 or more games after losing 10 or more games in the previous season. This is restricted to coaching changes that took place on or after May 1, 2010. For coaching changes that occurred earlier in 2010, see 2009 NCAA Division I FBS end-of-season coaching changes. All dates in November and December are in 2010; all January dates are in 2011. The "resigned/fired" listing indicates that a coach technically resigned, but at least one media report has stated that he was effectively fired. ^ "The 411 on eye black: NCAA bans messages". ESPN.com. 15 April 2010. ^ Campbell, Steve (2010-02-12). "NCAA rules committee says no to Case Keenum's eye-black messages". Houston Chronicle. Retrieved 2011-04-14. ^ "BYU to join WCC, go independent in football". ESPN.com. 2010-08-31. Retrieved 2017-07-22. ^ "USC won't be ranked in coaches' poll". ESPN.com. July 8, 2010. Retrieved January 5, 2011. ^ Associated Press (September 11, 2010). "Va. Tech suffers 2nd loss in 6 days as James Madison pulls off upset". ESPN.com. Archived from the original on 14 September 2010. Retrieved September 11, 2010. ^ a b "Virginia Tech's Tyrod Taylor Named ACC Player of the Year" (Press release). Atlantic Coast Conference. December 1, 2010. Archived from the original on 31 December 2010. Retrieved December 1, 2010. ^ "Maryland's Friedgen Named ACC Coach of the Year" (Press release). Atlantic Coast Conference. November 30, 2010. Retrieved December 30, 2010. ^ a b c "All-Big 12 Football Awards Announced" (Press release). Big 12 Conference. November 30, 2010. Retrieved November 30, 2010. ^ a b c "Conference USA Announces Football Players of the Year" (Press release). Conference USA. December 8, 2010. Retrieved December 30, 2010. ^ "UCF's O'Leary Named C-USA Football Coach of the Year" (Press release). Conference USA. December 8, 2010. Retrieved December 30, 2010. ^ a b c "MAC Announces 2010 Football Post Season Awards" (Press release). Mid-American Conference. December 1, 2010. Archived from the original on 16 December 2010. Retrieved December 1, 2010. ^ a b c "SEC Football Individual Awards Announced". Southeastern Conference. December 8, 2010. Retrieved December 8, 2010. ^ a b c "BIG EAST Announces 2010 Postseason Football Honors" (Press release). Big East Conference. December 8, 2010. Archived from the original on 21 January 2011. Retrieved December 30, 2010. 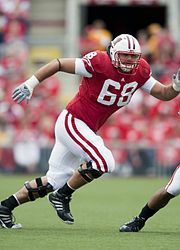 ^ a b c "Big Ten Announces 2010 Football All-Conference Teams and Individual Honors" (Press release). Big Ten Conference. 29 November 2010. Archived from the original on 22 December 2010. Retrieved 29 November 2010. ^ a b c "Mountain West Announces 2010 Football All-Conference Teams and Individual Honors" (Press release). Mountain West Conference. November 30, 2010. Archived from the original on 31 December 2010. Retrieved November 30, 2010. ^ a b c "Pac-10 Football Awards and All-Conference Team Announced" (Press release). Pacific-10 Conference. December 7, 2010. Retrieved December 30, 2010. ^ a b c d "FIU's Hilton Headlines 2010 All-Sun Belt Conference Football Teams" (Press release). Sun Belt Conference. December 8, 2010. Retrieved December 30, 2010. ^ a b c "All-WAC Football Teams and Players of the Year Announced" (Press release). Western Athletic Conference. December 6, 2010. Retrieved December 30, 2010. ^ "Buckeyes vacate wins from last football season". ESPN.com. 2011-07-08. Retrieved 2017-07-22. ^ "College Football Poll.com". www.collegefootballpoll.com. Archived from the original on 2010-12-15. Retrieved 2010-12-29. ^ Low, Chris (July 14, 2010). "Vanderbilt coach Johnson retires". ESPN.com. Archived from the original on 16 July 2010. Retrieved July 14, 2010. ^ "Brewster Relieved of Head Coaching Duties" (Press release). University of Minnesota Intercollegiate Athletics. October 17, 2010. Archived from the original on July 11, 2011. Retrieved October 17, 2010. ^ "North Texas fires Todd Dodge" (Press release). ESPN.com. October 20, 2010. Archived from the original on 23 October 2010. Retrieved October 20, 2010. ^ "Source: Embattled Dan Hawkins Out at Colorado". ESPN.com. November 9, 2010. Archived from the original on 10 November 2010. Retrieved November 9, 2010. ^ "Doug Martin To Step Down Following Friday's Game With Ohio" (Press release). Kent State Athletics. 21 November 2010. Archived from the original on 13 December 2010. Retrieved 27 November 2010. ^ Associated Press (November 24, 2010). "Stan Parrish out at Ball State". ESPN.com. Retrieved November 27, 2010. ^ "Pete Lembo Named Head Football Coach" (Press release). Ball State University Athletics. December 20, 2010. Retrieved December 21, 2010. ^ Low, Chris (November 27, 2010). "Robbie Caldwell steps down at Vandy". ESPN.com. Retrieved November 27, 2010. ^ Associated Press (December 17, 2010). "James Franklin takes over at Vandy". ESPN.com. Retrieved December 17, 2010. ^ Dinich, Heather (November 27, 2010). "Miami fires coach Randy Shannon". ESPN.com. Retrieved November 27, 2010. ^ a b "Miami Hires Al Golden as Head Football Coach" (Press release). University of Miami Athletics. 12 December 2010. Archived from the original on 16 December 2010. Retrieved 13 December 2010. ^ "Indiana fires coach Bill Lynch". ESPN.com. November 28, 2010. Archived from the original on October 20, 2013. Retrieved November 28, 2010. ^ Associated Press (December 7, 2010). "Kevin Wilson hired as Indiana's coach". ESPN.com. Archived from the original on March 7, 2014. Retrieved December 7, 2010. ^ Associated Press (November 29, 2010). "Steve Roberts resigns after nine years". ESPN.com. Retrieved December 2, 2010. ^ a b Feldman, Bruce (December 2, 2010). "Hugh Freeze hired at Arkansas St". ESPN.com. Retrieved December 2, 2010. ^ Associated Press (November 29, 2010). "La.-Lafayatte fires Rickey Bustle". ESPN.com. Retrieved November 29, 2010. ^ "Cajuns to Introduce Hudspeth on Monday". University of Louisiana-Lafayette Athletics. December 12, 2010. Retrieved 13 December 2010. ^ a b MacMahon, Tim (November 30, 2010). "Dan McCarney starts at North Texas". ESPNDallas.com. Retrieved December 6, 2010. ^ a b c d "Minnesota hires Jerry Kill as coach". ESPN.com. December 5, 2010. Retrieved December 6, 2010. ^ "Tom Matukewicz named NIU football interim head coach". "NIU Today". December 9, 2010. Retrieved 9 December 2010. ^ "Northern Illinois taps Dave Doeren". ESPNChicago.com. December 13, 2010. Retrieved December 13, 2010. ^ "Embree Named Colorado's Head Football Coach" (Press release). University of Colorado Athletics. December 6, 2010. Archived from the original on 2 January 2011. Retrieved December 20, 2010. ^ "Urban Meyer stepping down at Florida". ESPN.com. December 8, 2010. Retrieved December 8, 2010. ^ "Florida hires Will Muschamp as coach". ESPN.com. December 11, 2010. Retrieved December 11, 2010. ^ Zeise, Paul (December 10, 2010). "Bennett: Wannstedt to coach Pitt in bowl game". Pittsburgh Post-Gazette. Retrieved 12 December 2010. ^ a b Schad, Joe (December 15, 2010). "Source: Pitt hires Mike Haywood". ESPN.com. Retrieved December 15, 2010. ^ "Reports: Steve Addazio new Owls coach". ESPN.com. December 22, 2010. Retrieved December 22, 2010. ^ "Don Treadwell to coach RedHawks". ESPN.com. December 31, 2010. Retrieved December 31, 2010. ^ a b "Randy Edsall to coach Maryland". ESPN.com. January 3, 2011. Retrieved January 3, 2011. ^ "Pitt fires new coach Mike Haywood". ESPN.com. January 2, 2011. Retrieved January 2, 2011. ^ a b Associated Press (January 10, 2011). "Todd Graham to take over Pittsburgh". ESPN.com. Retrieved January 10, 2011. ^ "Paul Pasqualoni Named UConn Head Football Coach" (Press release). University of Connecticut Athletics. January 13, 2011. Retrieved January 13, 2011. ^ "Rich Rodriguez fired by Michigan". ESPN.com. January 5, 2011. Retrieved January 5, 2011. ^ a b Associated Press (January 11, 2011). "Brady Hoke named Michigan coach". ESPN.com. Retrieved January 11, 2011. ^ "Jim Harbaugh Named Head Coach of San Francisco 49ers" (Press release). Stanford Athletics. January 7, 2011. Archived from the original on March 18, 2012. Retrieved January 7, 2011. ^ "David Shaw Named Bradford M. Freeman Director of Football/Head Coach" (Press release). Stanford Athletics. Archived from the original on 12 January 2012. Retrieved 14 January 2011. ^ "Bill Blankenship Named Head Coach" (Press release). ESPN.com. January 14, 2011. Retrieved January 15, 2011. ^ Associated Press (January 12, 2011). "San Diego State promotes Rocky Long". ESPN.com. Retrieved January 12, 2011.